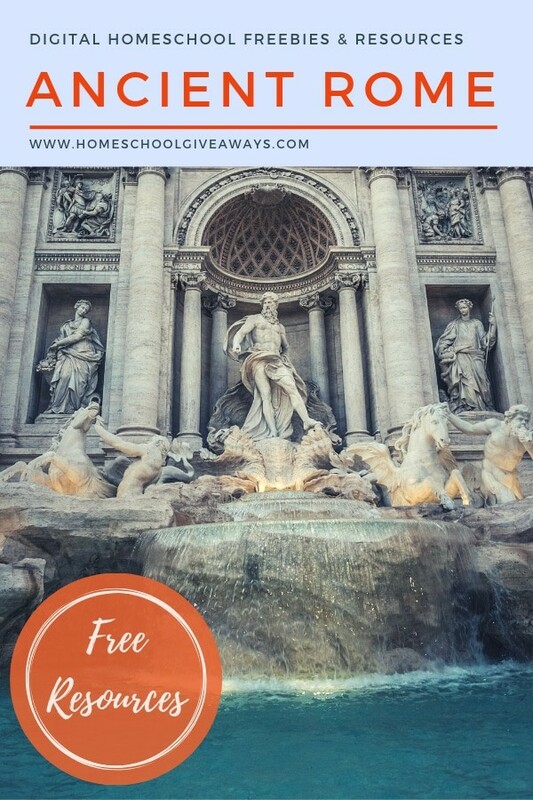 Alright, not everyone is packing their bags and collecting coins to throw in Trevi Fountain in Rome, Italy this summer, but that doesn’t mean you can’t have fun learning about Ancient Rome! A colossal, virtual learning adventure awaits! Grab some games, a couple of online courses, a few books, and an engaging movie or two and have a grand time exploring Rome – but without the crazy traffic and jet lag! Grab your FREEBIES below and don’t miss the 5 FREE resource links full of freebies at the end! When In Rome at Home…do as the Romans! To make it really feel like you’re on vacation, make some Roman-style pizza and homemade gelato. 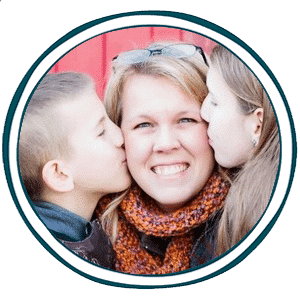 It won’t be quite like sitting outside at the Pantheon or in Piazza Novanna in Rome, but it will be so fun that when you do take your family to Italy for gelato you’ll say “Remember that time we made gelato and learned all about Rome?” Viva Roma! These short films & animations are fun for everyone. And if you need something for Family movie night, Roman Holiday is always a fabulous classic. The TedEd videos below provide opportunities to discuss the realities of life in Ancient Rome and what Jesus, his disciples, and the first Christians were up against as they spread the Gospel. A Day in the Life of A Roman Soldier – NR – TedEd. Most suitable for high schoolers. Parents may want to preview it first to ensure suitability for their families first. The 4 Sisters in Ancient Rome – NR – TedEd. Most suitable for high schoolers. Parents may want to preview it first to ensure suitability for their families first. A Glimpse of Teenage Life in Ancient Rome – NR TedEd. Again, most suitable for high schoolers. Parents may want to preview it first to ensure suitability for their families first. Roman Feats Of Engineering – NR Amazon Instant. A video about the amazing engineering projects of Roman times. There are tons of fun online games about Ancient Rome from Mr. Donn and on sites like NeoK12 & Ducksters too. I think this one is going to be the new favorite at our house! Voice Originals – When in Rome Travel Trivia Game Powered by Alexa. This game uses your Alexa speaker. How fun is that! Ancient Rome Digital/Online Courses: Fun curriculum that doesn’t feel like schoolwork! If you want to add in a few items that are school-ish, then these are great comprehensive curricula that are loads of fun to use. Project Passport Ancient Rome – A comprehensive curriculum for 3rd -8th graders. It’s downloadable now! Colosseum 3D Model Puzzle – Why stand in line with hundreds of others to see the Colosseum with your kids. Let them build it! This 3-D puzzle will keep the kiddos engaged and experiencing the architectural marvel that the Collosium really was. Now that’s a STEM project! Ok, these might feel like school, but they are guaranteed to pique interest and expand learning in a thoughtful and enjoyable way. These online courses will also allow you to have everyone studying ancient Rome at their learning level all at the same time. 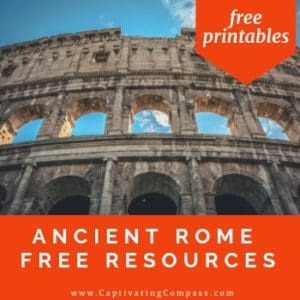 This list of Ancient Rome resources is getting as big as the Roman Empire itself! Enjoy these freebies! FREE Roman Game printables here, and a Roman Numeral Bingo Game here. It’s a quick cheat sheet of fun things to do and listen to. It will help your family learn even more about Ancient Rome! If you can’t get enough of ancient Rome and are eager to plan your own learn on location Roman Holiday, head over here for more travel planning and curricula resources.